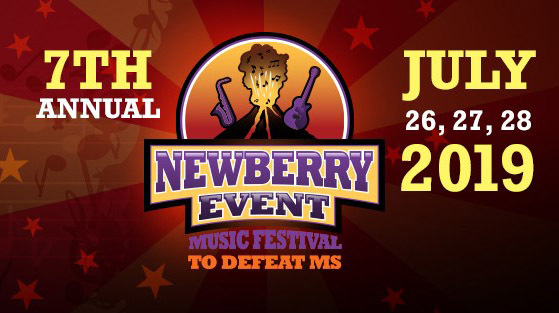 The 2019 Newberry Event Music & Arts Festival/Charity Fundraiser to Defeat MS is an outdoor, ticketed, 3-day festival well-known as a good time for a good cause. 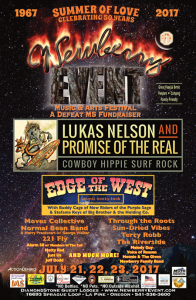 The 7th Annual Newberry Event Music Festival to Defeat MS is July 26, 27 and 28, 2019 at the DiamondStone Guest Lodge between Sunriver and La Pine. 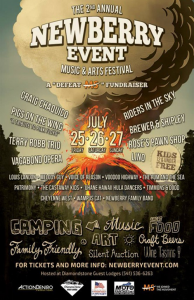 Shady aspens & pines create an unforgettable venue in south Deschutes County for this family friendly event (kids under 13 free). 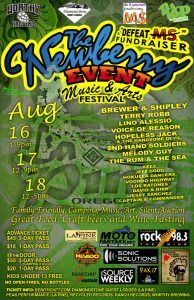 Hosting everything from rock, blues, jazz, reggae, folk, bluegrass and more, the 7th Annual Newberry Event offers up great live music to go along craft beers and wine, great food and artist vendors. You’ll find everything you need for the day or the weekend. It’s a family-friendly, affordable summer getaway with kids under 13 admitted free. Diamondstone Guest Lodge is located between Sunriver and La Pine, adjacent to Quail Run Golf Course. 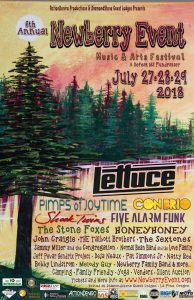 The 2018 line-up included artists Lettuce, Pimps of Joytime, Shook Twins, Con Brio, Five Alarm Funk, The Stone Foxes, HoneyHoney, Normal Bean Band and Merry Pranksters, John Craigie, Pat Simmons, Jr., Deja Neaux, Jeff Pevar and more. Camp under the stars and dance in the grass. Create great memories, all for a good cause. 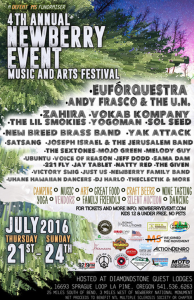 Camping all three days is highly recommended as you won’t want to leave, with the myriad of vendors, food, fine wine and local brews on site. 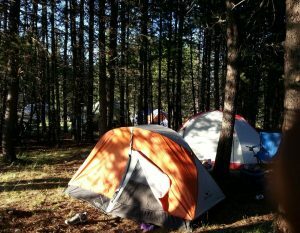 Tent camping is free with 3-day event ticket. There are limited RV passes for trailers or motorhomes for an additional fee. 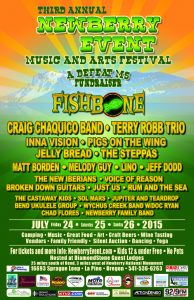 This is a limited ticketed fundraising festival. 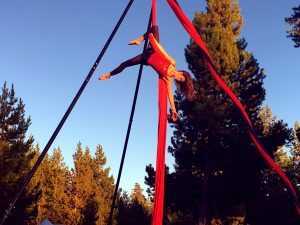 More than just music - local artisans offer all-natural handcrafted goods.You'll also enjoy aerial artists, homemade arts & crafts, and a silent auction plus raffles of incredible fine art and merchandise. IRS charitable donations are gratefully accepted. Multiple Sclerosis is a neurologic and auto-immune disease that can keep people from moving. Newberry Country comes together for fun and a heart to raise non-profit funds to benefit the Oregon Chapter of the National Multiple Sclerosis Society.